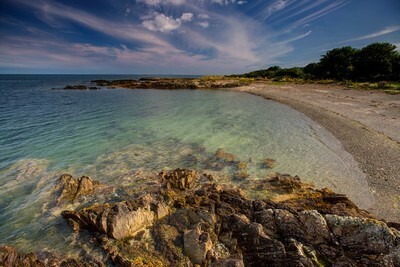 Quintin Bay is about 2 miles east of the small town of Portaferry on the southern end of the Ards Peninsula in County Down, near the Narrows at the entrance to Strangford Lough. 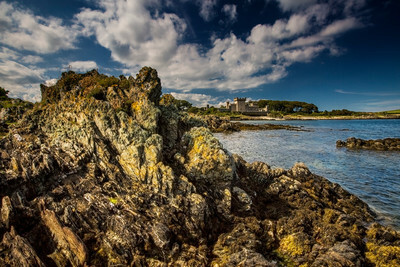 Home to Quintin Castle, one of the very few occupied Anglo-Norman castles in Ireland, which was built by John de Courcy in 1184, you can drive down Quintin Bay Road and walk onto the beach. 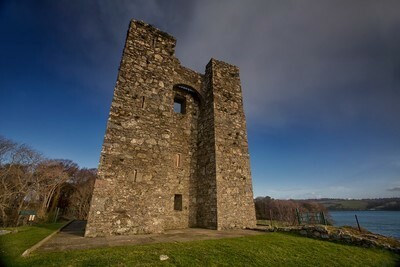 Castle Ward, overlooking Strangford Lough, has been home to the Ward family since the 16th century. 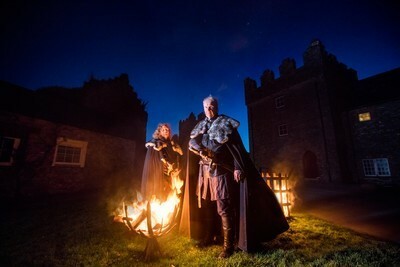 The 18th century mansion house is a unique blend of both classical and gothic architectural styles, resting on a rolling hillside overlooking the lough and surrounded by a beautiful 820-acre walled demesne with gardens and woodland. A National Trust property, Castle Ward is open year-round. Situated in an area of County Down known as Lecale, bordered by Strangford Lough and the Irish Sea on the north, east and south coasts, Audley's Field is one of many things 'Audley' in the area. Named after the original Norman family who came over around 1210, the Audleys lived in the castle up to the mid 17th Century. It is a beautiful, rural spot, with small fields and rolling low hills and easily accessible on foot if you are already visiting Castle Ward. By car, travel along the A7 Belfast Road and head towards Inch Abbey Road. Follow this road for approximately 500 yards and Audley's Castle and field are on the left hand side. The Quoile River (from the Irish: An Caol meaning 'the narrow') is a river in County Down, where, in October 1991 during dredging operations, a piece of oak, perhaps the remains of a log-boat, was found. Following dendrochronological dating it was found to have a Neolithic date of 2739 BC. The Quoile Countryside Centre is a glorious wetland retreat, located just outside Downpatrick, which boasts a variety of beautiful and tranquil woodland and riverside walks. 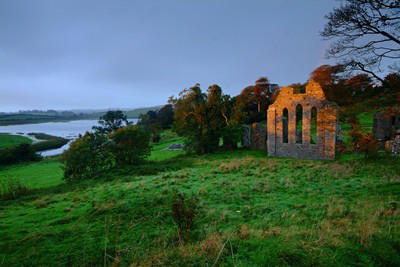 These extensive remains are of a Cistercian Abbey founded in 1180, by John de Courcy and set in a beautiful location beside the River Quoile, with distant views towards de Courcy's Cathedral town of Downpatrick. 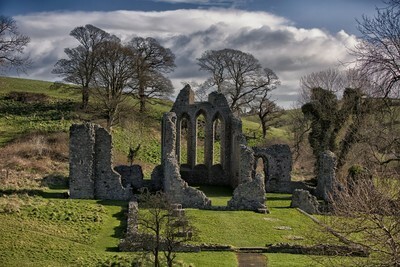 Although not immediately obvious, Inch Abbey was erected on an island that is accessed by a causeway, with the River Quoile to the south and marshland to the north. Visible in the distance is Downpatrick Cathedral, burial place of Ireland’s patron saint. Cairncastle or Carncastle, from the Irish 'carn' meaning 'mound' and the English word 'castle' is a small village and civil parish in County Antrim near the town of Larne and inland from the village of Ballygally. Located on the windswept Antrim Plateau on a basalt escarpment above the village is Knock Dhu, (from the Irish for 'black hill') a Bronze Age promontory fort and settlement. Lying a few miles east of the town of Ballymena, this valley lies beneath Slemish Mountain in County Antrim. The mountain itself is said to be where St Patrick, Ireland’s patron saint, once tended sheep after being brought to the area by pirates who slaughtered his family. 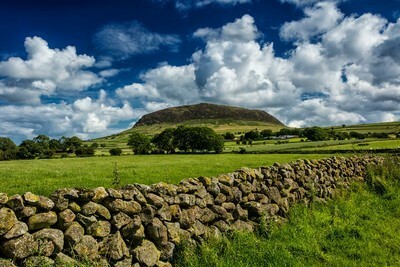 Slemish is the plug of an extinct volcano and lies within an Environmentally Sensitive Area (ESA). It is an ideal location for bird watchers where large black ravens, buzzards, wheatears and meadow pipits can be seen regularly. Glenariff (from the Irish Gleann Aireamh, meaning 'valley of the ploughman/arable valley') is one of the Glens of Antrim and like all glens in that area, it was shaped during the Ice Age by giant glaciers. 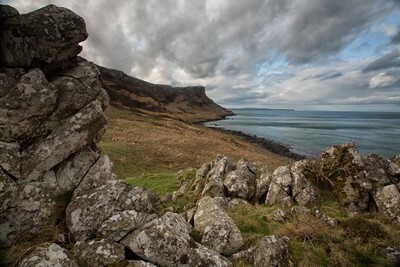 It is sometimes called the 'Queen of the Glens' and is the biggest and most popular of the Glens of Antrim. 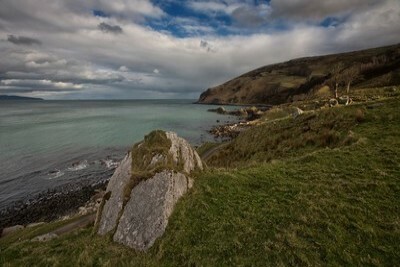 The village of Waterfoot lies on the coast at the foot of the glen while a popular tourist destination is the Glenariff Forest Park with its trails through the trees and alongside picturesque waterfalls. The village of Cushendun stands on an elevated beach at the outflow of the Glendun and Glencorp valleys and at the mouth of the River Dun. Centuries before this genteel village was built, Cushendun was a safe landing place and harbour for the frequent travellers between Ireland and Scotland. 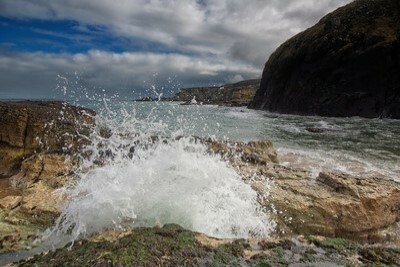 The caves, formed over 400 million years ago are easily accessible by foot along the coast from the village. 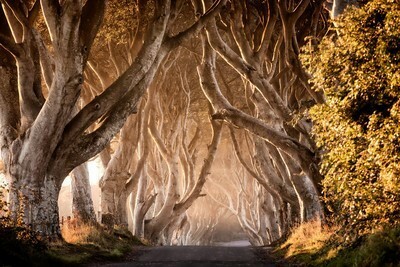 The Dark Hedges is one of the most photographed natural phenomena in Northern Ireland and a popular attraction for tourists from across the world. This beautiful avenue of beech trees was planted by the Stuart family in the 18th century and intended to impress visitors as they approached the entrance to Gracehill House. Centuries later the trees remain a magnificent sight and have become known as the Dark Hedges. The Grey Lady (a lost spirit from a long abandoned graveyard) is said to appear at dusk amongst the trees. 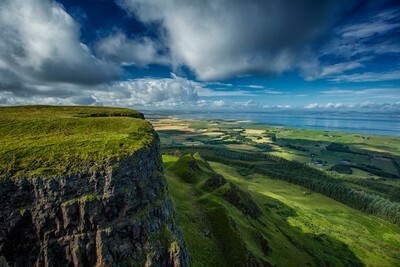 Binevenagh or Benevenagh marks the western extent of the Antrim Plateau formed around 60 million years ago by molten lava. 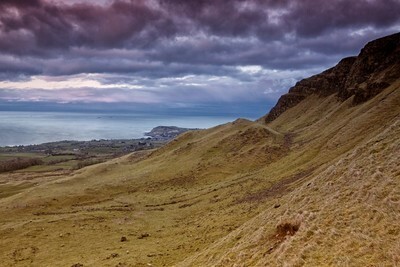 The plateau and steep cliffs extend for over 6 miles across the peninsula of Magilligan, dominating the skyline over the villages of Bellarena, Downhill, Castlerock and Benone beach. The area has been classified as both an Area of Special Scientific Interest and as an Area of Outstanding Natural Beauty. 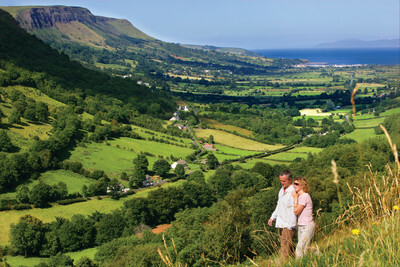 Dotted along the famous Causeway Coast and Glens route which travels north from Belfast right up to the Giant’s Causeway and one of the most beautiful driving roads, Murlough Bay is a hidden gem off the main road, across a cattle grid and down a steep winding path to a coastal path and beach. Larrybane bay on the North Antrim Coast, protected by Sheep Island and a shallow reef, is one of the most sheltered and scenic locations along the Causeway Coast. 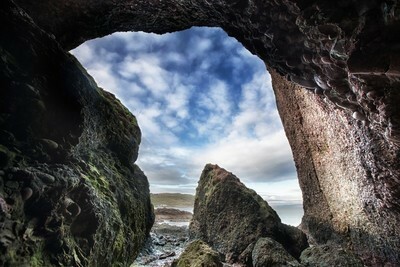 Beneath the limestone cliffs of Larrybane is an unusual sea cave; it was formed shortly after the last ice age when the sea levels were much higher than they are today. Its present position above the reach of the destructive power of the sea has allowed some wonderful karst features to develop inside, including fine pillars, stalactites and stalagmites. Ballintoy, from the Irish 'Baile an Tuaigh' meaning 'the northern townland', is a village on the coast of County Antrim with the small fishing harbour located at the end of a very small, narrow, steep road down Knocksaughey hill which passes by the entrance to Larrybane and Carrick-a-Rede Rope Bridge. Known as a 'raised beach', it is located alongside the B15 coast road, 17 miles north-east of Coleraine and five miles west of Ballycastle. 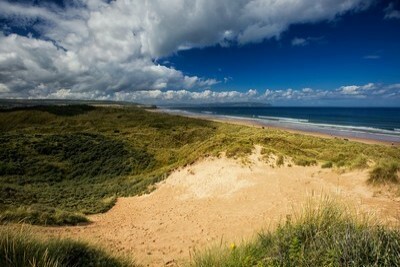 Between Portstewart town and the mouth of the River Bann lies the golden sands and domineering sand dunes of Portstewart Strand. 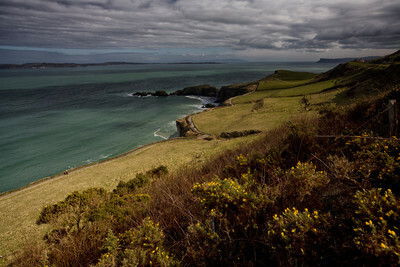 This area of natural beauty and of scientific interest is owned and managed by the National Trust. Sweeping along the edge of the North Coast, it is one of Northern Ireland's finest beaches and affords views of Inishowen headland and Mussenden Temple perched atop the cliffs. Located in the very north of Northern Ireland, Downhill Beach is part of a 7 mile stretch of sand and surf offering a wealth of activities including water sports and scenic walks. Cars are permitted on this Blue Flag beach throughout the year. 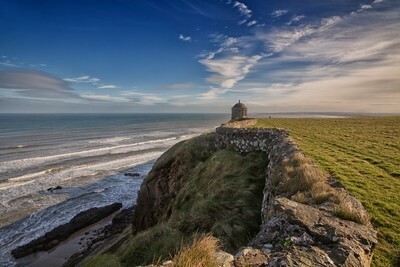 Above the beach, the prominent Mussenden Temple, one of the most photographed buildings in Northern Ireland offers breath-taking views of the North Coast to the Counties of Derry, Donegal and Antrim. Tollymore in the Mournes has four way-marked trails of varying lengths taking the visitor on a tour of the park’s most beautiful areas. These trails follow a circular route and are sign posted from the information board in the main car park. Oak wood from Tollymore was the preferred material for the interiors of the White Star liners including the Titanic which was built in Belfast. 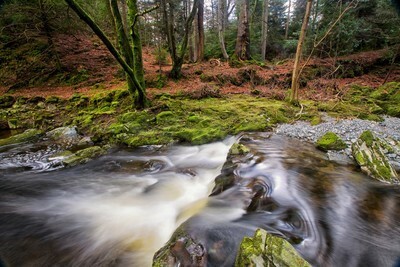 Located in the foothills on the Mourne Mountains, Tollymore was the first state forest park in Northern Ireland, established in 1955. Covering an area of 1600 acres, it boasts myriad walking trails that can be traversed to the gurgling accompaniment of the Shimna River. Leitrim Lodge can be found near Hilltown in the western Mourne Mountains, a granite mountain range in County Down in the south-east of Northern Ireland with staggering panoramic views from points like Eagle Mountain, the highest peak in the western Mournes. From here you can survey Slieve Foye and the Cooleys to the west, the distant Sperrins and Belfast Hills to the north, and east to the high Mournes. 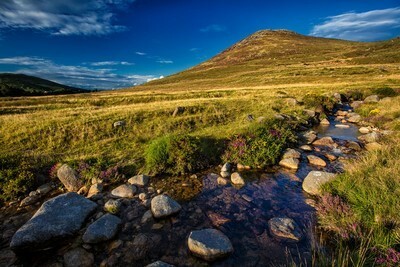 The Mournes is an area of outstanding natural beauty and has been proposed as the first national park in Northern Ireland.